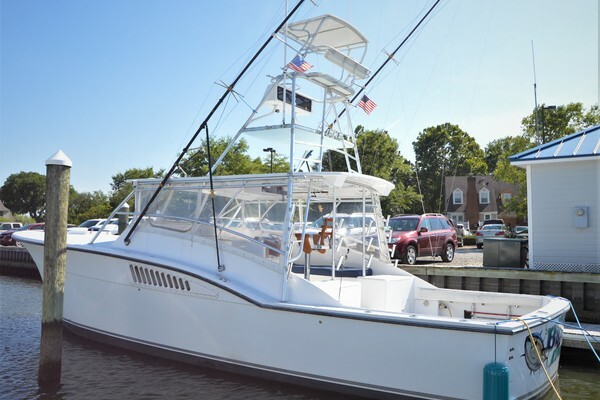 A Classic 45' Matthews Sport Fish, Turn key, indoor stored year round, fresh hull paint, entire vessel went through a full structural and cosmetic update 5 years ago. Twin 8V53 TI, Diesel with Turbos. Radar, GPS, Depth Speed, Air and Heat, Generator, Great rough water sports-fish. Great Live Aboard. Vessel is off site, please call listing broker for an appointment. Don't let this one pass you by will be gone QUICK!!! Unbelievable deal on a classic 45SF Matthews Sportfish. Turns heads at every port. Owner is relocating and wants this boat sold. Price reduced from $39,900 to $25,900 for a quick sale. Best deal, we have found for a twin diesel sportfish. Don't let the low-price fool you. Great sea boat can handle the rough stuff with ease. Cruise at 18-knots or run a trawler speeds for a very economical day on the water. Massive foredeck, huge teak aft deck and spacious salon makes entertaining a breeze. Two staterooms with berths for 5, full head with stall shower and full galley make this a comfortable long-range cruiser. Forward stateroom also has its own toilet and sink. Perfect for that cruise to Georgian Bay, Chesapeake, or where ever your dreams take you. You won't find another 45SF diesel Matthews at this price.